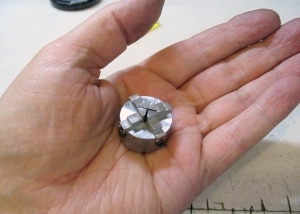 Homemade miniature 4-jaw, 1" diameter chuck intended for use with a small model lathe. Spindle features M12 x 1.5 thread. Jaws machined from cold rolled steel. dean, i need help with getting also your miniature 1" chuck. jaws from machinable polymer. project: grip a diamond and measure space charge above the diamond. we are trying to upset physics with room temperature super conductor. please, I need this. your price?